If you think exoplanet detections are only in the realm of professional planet-hunting telescopes such as Kepler, take a look at the video above. David Schneider, a senior editor for IEEE Spectrum, explains that it takes little more than a DSLR camera and a camera lens to catch a glimpse. Schneider told Universe Today that he’s not an experienced amateur observer, nor should his equipment be expected to detect new exoplanets. But the potential for the future is interesting, he explained. Schneider chose HD 189733, whose hostile-to-life “deep blue” exoplanet is about 63 light-years away and transits the face of the star every 2.2 days. But often these transits take place at inconvenient times (such as during the day, and the star is low on the horizon). He also faced several cloudy nights, meaning it was several weeks until he could take the imagery. At the most basic level, Iris allows you to perform the corrections that are customary for really all types of digital astrophotography. In particular, you correct for ‘hot pixels’ in your camera sensor and for variations in the sensitivity of the sensor across the frame. This is standard stuff in astrophotography, requiring that you take images with the lens cap on (so-called “darks”), of a uniformly illuminated background (“flats”), and so forth. For this project, you also need to use the tools that Iris provides to do what’s called aperture photometry. In a nutshell, you have to adjust the registration of the set of images you collect so that the stars are in the same position in each image. Then you have to set up things in Iris to do photometric measurements of a selected set of stars in one frame. After that, Iris will perform the photometry you want on the whole set of images you have in an automated fashion. While his equipment isn’t sophisticated enough to account for “false positives” such as a sunspot going across a star — amateurs are more at the stage of confirming professional observations — Schneider pointed out there are many similar projects to his own. Among them are KELT-NORTH (which inspired his search), Evryscope, and this group at the University of Arizona. “My project merely highlights that you can get your feet wet in this area with some really cheap hardware,” Schneider said. He recommends those that want to do similar work to his read the IEEE Spectrum article, buy the hardware required, read up on astrophotography and Iris, and not be afraid to experiment. In the medical field, X-rays are used for finding and diagnosing all sorts of ailments hidden inside the body; in astronomy X-rays can also be used to study obscured objects like pulsars and black holes. Now, for the first time, X-rays have been used to study another object in space that tends to be difficult to spot: an extra solar planet. The Chandra X-ray Observatory and the XMM Newton Observatory combined their X-ray super powers to look at an exoplanet passing in front of its parent star. This is not a new detection of an exoplanet – this same exoplanet, named HD 189733b has been one of the most-observed planets orbiting another star, and was recently in the news for Hubble confirming the planet’s ocean-blue atmosphere and the likelihood of having glass raining down on the planet. But being able to see the exoplanet in X-rays is good news for future studies and perhaps even detections of planets around other stars. HD 189733b is a Jupiter-sized extrasolar planet orbiting a yellow dwarf star that is in a binary system called HD 189733 in the constellation of Vulpecula, near the Dumbell Nebula, approximately 62 light years from Earth. This huge gas giant orbits very close to its host star and gets blasted with X-rays from its star — tens of thousands of times stronger than the Earth receives from the Sun — and endures wild temperature swings, reaching scorching temperatures of over 1,000 degrees Celsius. Astronomers say it likely rains glass (silicates) – sideways — in howling 7,000 kilometer-per-hour winds. But it is relatively close to Earth, and so it has been oft-studied by many other space and ground-based telescopes. In a blog post, Poppenhaeger said she was inspired by the launch of the Kepler telescope, and wondered if exoplanets could be seen in X-rays. She was excited when she found archived data from XMM Newton showing a fifteen hour long observation of the star HD 189733 and the “Hot Jupiter” HD 189733b was crossing in front of the star during that observation. But the light curve was disappointing, she said. “The star is magnetically active, meaning that its corona is bright and flickering, so its X-ray light curve showed lots of scatter. Looking for a transit signal in this light curve was like trying to hear a whisper in a noisy pub,” Poppenhaeger wrote. She knew with more data, the transit signal would be clearer, so she applied for – and got – time on Chandra to observe this exoplanet. That means that the outer atmosphere has to be heated up to about 20,000 K to sustain itself at such high altitudes. Additionally, the planet loses its atmosphere about 40% faster than thought before. Poppenhaeger said she and her colleagues will test more X-ray observations of other similar planets such as CoRoT-2b to learn more about how stars can affect a planet’s atmosphere. Since its discovery in 2005, exoplanet HD 189733b has been one of the most-observed planets orbiting another star, as its size, compact orbit, and proximity to Earth has made it a relatively easy target — as extrasolar planets go. From previous studies, astronomers thought the planet may have an enticing blue-sky atmosphere. Now, further examinations with the Hubble Space Telescope have confirmed this planet really does harbor an azure blue atmosphere, very similar to Earth’s ocean blue color. But this is no ‘pale blue dot’ ocean world. It is a huge gas giant orbiting very close to its host star. It gets blasted with X-rays from its star — tens of thousands of times stronger than the Earth receives from the Sun — and endures wild temperature swings, reaching scorching temperatures of over 1,000 degrees Celsius. 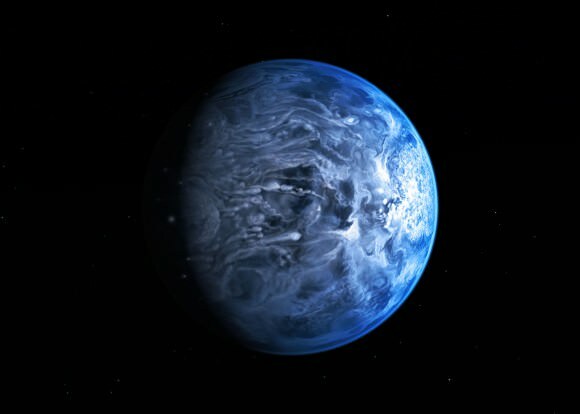 Astronomers say it likely rains glass – sideways — in howling 7,000 kilometer-per-hour winds. Nope, not a place you’d want to visit. But the new Hubble observations of its color are the first time an exoplanet’s color has been measured and confirmed. The astronomers measured how much light was reflected off the surface of HD 189733b — a property known as albedo. The planet’s blue atmosphere does not come from the reflection of a warm ocean, but is due to a hazy, turbulent atmosphere thought to be laced with silicate particles, which scatter blue light. Earlier observations using different methods have reported evidence for scattering of blue light on the planet, but these most recent Hubble observations give robust confirming evidence, the researchers said. To make their measurements, the team used Hubble’s Space Telescope Imaging Spectrograph (STIS) to look at the system before, during, and after the planet passed behind its host star as it orbited. As it slipped behind its star, the light reflected from the planet was temporarily blocked from view, and the amount of light observed from the system dropped – not by much, about one part in 10,000 — but this was enough for STIS to determine the albedo. According to the team’s paper, HD 189733b has an albedo of 0.4 ± 0.12. The team says this determination will help in future studies of the atmospheres of other extra solar planets, as well as continuing the studies of one of the most-examined planets orbiting another star. Since its discovery in 2005, exoplanet HD 189733b has been one of the most-observed extra solar planets, due to its size, compact orbit, proximity to Earth and enticing blue-sky atmosphere. But astronomers using the Hubble Space Telescope and the Swift Telescope have witnessed dramatic changes in the planet’s upper atmosphere following a violent flare from its parent which bathed the planet in intense X-ray radiation. The scientists say being able to watch the action gives a tantalizing glimpse of the changing climates and weather on planets outside our Solar System. While HD 189733b has a blue sky like Earth, it is one of the many “hot Jupiters” that have been the easiest for exoplanet hunters to find: huge gas planets that orbit extremely close to its star. HD 189733 lies extremely close to its star, called HD 189733A, just one thirtieth the distance Earth is from the Sun, whipping around the star in 2.2 days. Additionally, the system is just 63 light-years away, so close that its star can be seen with binoculars near the famous Dumbbell Nebula. Even though its star is slightly smaller and cooler than the Sun, this makes the planet’s climate exceptionally hot, at above 1000 degrees Celsius, and the upper atmosphere is battered by energetic extreme-ultraviolet and X-ray radiation. Even though HD 189733b’s atmosphere wasn’t thought to be evaporating (like a similar exoplanet called Osiris, or HD 209458b) astronomers knew the potential was there. The atmospheric gases extend far beyond the planetary “surface” allowing stellar light to pass through, and in previous observations astronomers were able to get a peek into what chemical compounds surround HD 189733b. From this analysis, scientists deduced that water and methane is contained in the atmosphere; and later, the Spitzer space telescope even mapped the temperature distribution around the globe. Additional research indicated a thin layer of particles exists in the upper atmosphere of HD 189733b, creating thin reflective clouds. Astronomer Alain Lecavelier des Etangs from at the Paris Institute of Astrophysics in France led a team using Hubble to observe the atmosphere of this planet during two periods in early 2010 and late 2011, as it was silhouetted against its parent star. While backlit in this way, the planet’s atmosphere imprints its chemical signature on the starlight, allowing astronomers to decode what is happening on scales that are too tiny to image directly. They were hoping to observe the atmosphere evaporating away, but were disappointed in 2010. The team’s follow-up observations, made in 2011, showed a dramatic change, with clear signs of a plume of gas being blown from the planet at a rate of at least 1000 tons per second, at speeds of 300,000 mph, giving the planet a comet-like appearance. So why was the atmosphere’s condition changing? Despite the extreme temperature of the planet, the atmosphere is not hot enough to evaporate at the rate seen in 2011. Instead the evaporation is thought to be driven by the intense X-ray and extreme-ultraviolet radiation from the parent star, which is about 20 times more powerful than that of our own Sun. Taking into account also that HD 189733b is a giant planet very close to its star, then it must suffer an X-ray dose 3 million times higher than the Earth. Because X-rays and extreme ultraviolet starlight heat the planet’s atmosphere and likely drive its escape, the team also monitored the star with Swift’s X-ray Telescope (XRT). On Sept. 7, 2011, just eight hours before Hubble was scheduled to observe the transit, Swift was monitoring the star when it unleashed a powerful flare. It brightened by 3.6 times in X-rays, a spike occurring atop emission levels that already were greater than the sun’s. “The planet’s close proximity to the star means it was struck by a blast of X-rays tens of thousands of times stronger than the Earth suffers even during an X-class solar flare, the strongest category,” said co-author Peter Wheatley, a physicist at the University of Warwick in England. After accounting for the planet’s enormous size, the team notes that HD 189733b encountered about 3 million times as many X-rays as Earth receives from a solar flare at the threshold of the X class. The team also said the changes in the star’s output may mean it undergoes a seasonal process similar to the Sun’s 11-year sunspot cycle. The team hopes to clarify the changes they witnessed using future observations with Hubble and ESA’s XMM-Newton X-ray space telescope, but say there is no question that the planet was hit by a stellar flare, and no question that the rate of evaporation of the planet’s atmosphere shot up. This research shows the benefits of collaborative research between missions, as Swift saw the flare, and Hubble saw the massive amount of gas stripped out of the planet’s atmosphere. It also gives potential for future research, to watch for changes in both the star and atmospheres of other worlds. Lead image caption: This artist’s rendering illustrates the evaporation of HD 189733b’s atmosphere in response to a powerful eruption from its host star. NASA’s Hubble Space Telescope detected the escaping gases and NASA’s Swift satellite caught the stellar flare. Credit: NASA’s Goddard Space Flight Center. Another technique has been added to the exo-planet hunters’ toolkit, and it doesn’t require huge ground-based telescopes or space-based observatories. A group of astronomers developed the new technique by using a relatively small Earth-based infrared telescope to identify an organic molecule in the atmosphere of a Jupiter-sized planet nearly 63 light-years away. This new ground-based technique will enable the study of atmospheres of planets outside our Solar System, accelerating our search for Earth-like planets with life-related molecules. On Aug. 11, 2007, Mark Swain from JPL and his team turned the NASA Infrared Telescope Facility – a 3-meter telescope on the summit of Mauna Kea, Hawaii, — to the hot, Jupiter-size planet HD 189733b in the constellation Vulpecula. Every 2.2 days, the planet orbits a K-type main sequence star slightly cooler and smaller than our Sun. HD189733b had already yielded breakthrough advances in exoplanet science, including detections of water vapor, methane and carbon dioxide using space telescopes. Using a novel calibration method to remove systematic observation errors caused by instability of Earth’s atmosphere, they obtained a measurement revealing details of the HD189733b’s atmospheric composition and conditions, an unprecedented achievement from an Earth-based observatory. They detected carbon dioxide and methane in the exo-planet’s atmosphere of HD 189733b with the SpeX spectrograph, which splits light into its components to reveal the distinctive spectral signatures of different chemicals. Their key work was development of the novel calibration method to remove systematic observation errors caused by the variability of Earth’s atmosphere and instability due to the movement of the telescope system as it tracks its target. his scheme explains how the spectrum of the planet is isolated. First the spectrum of both, the planet and ist central star is registered; then, when the planet is hidden beyond the star, one obtains the spectrum of the star alone. If one subtracts the second from the first, one obtains the spectrum of the planet alone. It took the researchers more than two years to develop their method so that it could be applied to spectroscopic observations with the 3 meter telescope, enabling the identification of specific molecules such as methane and carbon dioxide. During their observations, the team found unexpected bright infrared emission from methane that stands out on the day side of HD198733b. This could indicate some kind of activity in the planet’s atmosphere which could be related to the effect of ultraviolet radiation from the planet’s parent star hitting the planet’s upper atmosphere, but more detailed study is needed. “An immediate goal for using this technique is to more fully characterize the atmosphere of this and other exoplanets, including detection of organic and possibly prebiotic molecules” like those that preceded the evolution of life on Earth, said Swain. “We’re ready to undertake that task.” Some early targets will be the super-Earths. Used in synergy with observations from NASA’s Hubble, Spitzer and the future James Webb Space Telescope, the new technique “will give us an absolutely brilliant way to characterize super-Earths,” Swain said. Their work is reported today in the Feb. 3, 2010 edition of Nature. For a great FAQ about using spectrum to study exoplanets, see this page by the Max Planck Institute for Astronomy.